The patterns are taped to the flesh side of the leather at multiple points and traced with a pen (I prefer a red rollerball pen of the kind used for proofreading). The tape does cause slight degradation of the pattern each time it's used by pulling off some of the felt fibers, but unless you're making large numbers of boots all of the same size, this shouldn't be a problem. Once one vamp and its matching sole have been cut out, it's time for a final fitting. 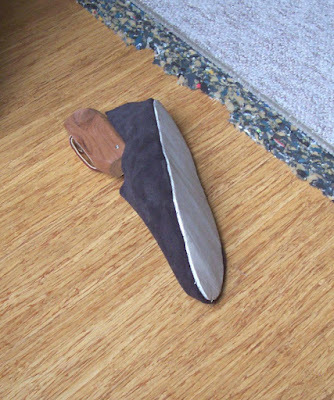 Although felt is probably the best commonly-available material for simulating leather in test fittings, it's not perfect, and in particular it doesn't really simulate the thick leather of the sole. When the sole approaches 1/4 inch (over 6mm) in thickness, the stitch holes are put in at an angle, emerging from the edge rather than the other side as with a thin felt sole. 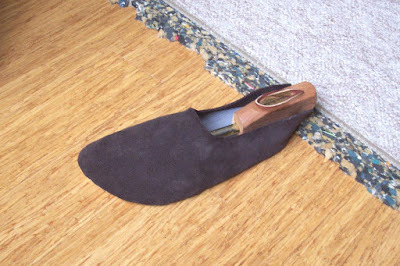 Therefore when the finished shoe is turned rightside-out, the upper wraps around the sole and fits in a slightly different manner. 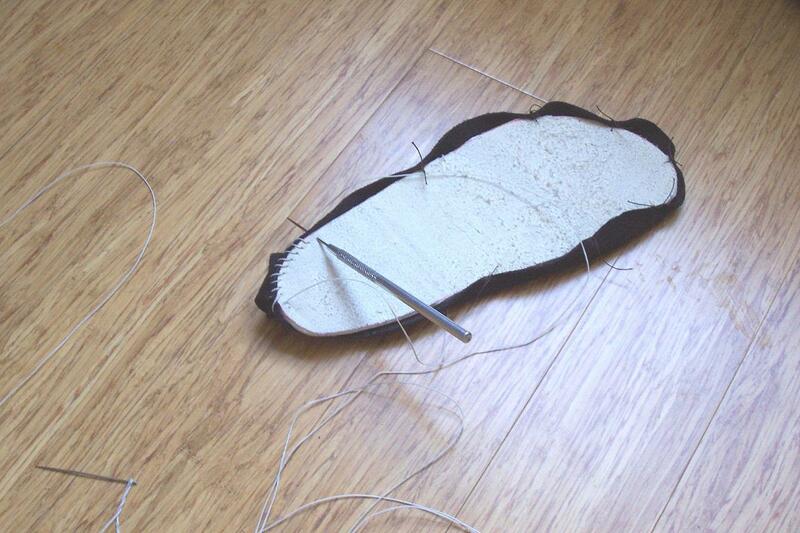 I soon discovered, by basting the upper and sole together, that I'd cut the felt patterns rather too long. This is, of course, not as bad as if they'd been too short, but refitting is a pain. I traced the excess while the shoe was still on my foot and took it apart to re-cut. Everyone's feet are slightly different shapes. Mine are narrow in the heel and wide across the ball. A good fitting requires a rather odd shape. I re-traced the altered upper onto the pattern so that the correction will be permanently incorporated into it. Finally, it's time to sew up. I'm using Crazy Crow's five-ply waxed linen cord in "natural," but waxed hemp would probably be more correct for Central Asia, and real sinew is ideal (. White linen cord from a major craft chain like Michael's would probably be okay since no one will see it - it's certainly no less correct than the latigo, which will be visible. Artificial sinew and other synthetic materials should be considered a last resort. Speaking of latigo, it's a very tough material and difficult to pierce with the kind of awl I'm using here. This is a hobby awl made for light applications. I am informed by Nadeem Ahmad and Jax Reeder that an awl with a diamond cross section and mushroom handle will make putting holes in the sole much easier. The finished foot. Once stitching is completed, the toe is pushed inward and the entire shoe slowly inverted so that the stitching faces inward. The insole will keep the stitching from touching your foot. I re-cut the upper perhaps a bit too short, while the sole is still a bit too long and wide, making for an odd fit, but it doesn't yet appear so bad as to be unusable. Luckily, a single cowhide split should yield enough material for a second pair if the first one doesn't work out.